Another day in London for the intrepid gig-going duo from Shoesville, as the capital seems to be the only place within a sensible distance that you will consistently find interesting gigs these days. Quite what has happened to the gig circuit in this country is a discussion for another time, I’m sure. Arriving on a pleasantly warm mid-afternoon after a leisurely train journey to the capital, Phil W and I for some reason thought that heading over to Covent Garden for a long cool drink would be good idea, forgetting what a tourist trap that area has always been. £3.75 for a Mint Cooler, which was essentially a glass of real lemonade with some lime segments and mint leaves floating in it highlighted that particular financial folly. Still, it did the job. Then we met up with my mate Pete over a rather scrumptious pizza in an eaterie directly opposite the venue. Pete would later tell me that my idiot dancing to Amplifier inspired in him a mix of awe and abstract fear, which at my age I’m quite proud of! You see, having stood for four hours it was a case of move or seize up. The downside of this is that as the temperature in the venue must have been close to 100F and the humidity at a dishcloth-wringing 100%, I sweated half my bodyweight in the time I was there. Compere for the night was Billy Reeves, the man behind Kscope’s entertaining podcasts. Thanking us for coming, he introduced the first act, and the real reason I came to the first rather than the second night of this splendid beano. Henry Fool are one of those studio-only bands that come together once in a blue moon when its members’ schedules allow, and we were lucky enough to witness a rare live appearance from this splendid jazz-prog combo, showcasing their equally wonderful album Men Singing. 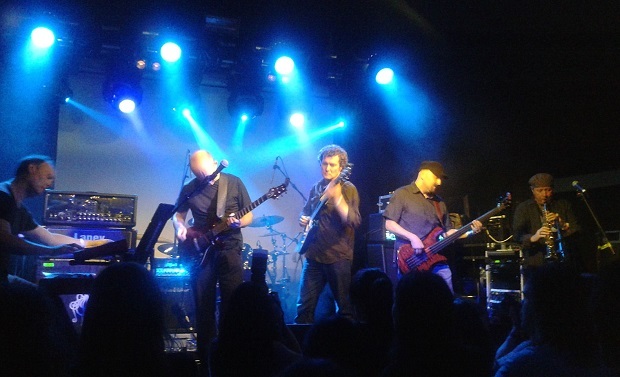 Starring Myke Clifford on sax and flute, who also acted as a dryly humorous frontman, aided and abetted by no-man alumni Stephen Bennett on keyboards and musical direction, Mike Bearpark on lead guitar, Tim Bowness on noise guitar and effects, and Andy Booker on the drums. Guesting on bass was none other than Colin Edwin, who is actually not as tiny as I had remembered from Porcupine Tree’s Albert Hall appearance! The band gave us a marvellous helping of jazz-prog with a large slice of Canterbury and pre-ambient Eno influence, but all within a modern frame of reference. Being first on, a good third of the near-capacity 500ish crowd had yet to turn up. It was their loss, believe me. Myke Clifford was for me the undoubted star of the show, his firey sax playing in particular being of a consistently high standard, sometimes venturing into free-jazz territory reminiscent of Ornette Coleman no less. This man should be an internationally recognised star, no question. Henry Fool were, for me at any rate, decidedly the musical if not the emotional highlight of the evening, and their mere half hour on stage was not nearly enough. Given the heat, the band would probably disagree! Luckily the band were so enthused by their performance that they have since annouced on their Facebook page that more gigs are being planned…well, “talked about” is the phrase they use. Let’s hope it comes to fruition. After a dash to the bar for more pints of tapwater, which being free was a no-brainer given that a small bottle of the life-saving liquid was selling at a wallet melting £2.10. I found this out when I asked a guy next to me at the bar who had just bought one. Ironically he said “Yeah, but it is the cheapest thing here”. Let’s just say he wasn’t amused when I replied with “Watch this” and promptly ordered three pints of tapwater, gratis. Wahey! 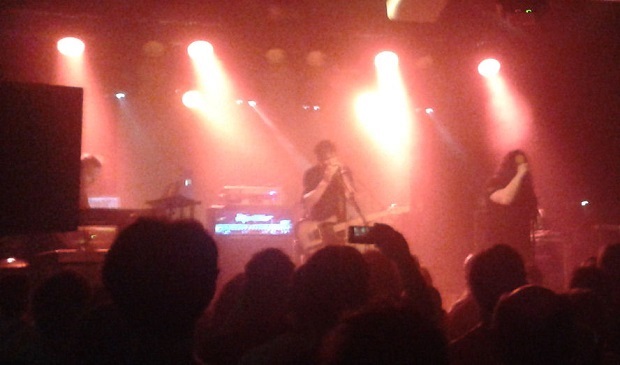 Next up, and “Flown in all the way from Rome” for the occasion were atmospheric post-proggers Nosound. Band leader Giancarlo Erra was wearing his Burning Shed 10th anniversary t-shirt, a blinding gig where Phil and I had caught his solo set showcasing the splendid Memories Of Machines albumWarm Winter. Nosound’s thing is grandiose slow paced minor key epics topped by Giancarlo’s guitar freakouts, or, in the case of closer Paralysed a long howl from the soul that teeters at the edge of his vocal range conveying true emotion. The sheer force of his vocal effort left him breathless, and was a fitting end to the set. To be honest I prefer the stripped down acoustic versions of Nosound’s slow burning heart stoppers, which Giancarlo has released on the rather fine albumThe Northern Religion Of Things. In the full band format the consistently low pace of the songs lends the dynamics something of a one-dimensional feel. Having said that, the crowd loved it, and Giancarlo shows his not inconsiderable chops when he lets rip on his guitar, in a style recalling a more animated Dave Gilmour. As is the way with gigs featuring more than a couple of acts, time was running short, and so Giancarlo had to jettison The Anger Song, which they had intended to play before Paralysed. Next up were Bruce Soord and Jonas Renske, amusingly introduced by Billy as being from “The wild west and the frozen north”. While the latter may only be a slight exaggeration in the case of Jonas, hailing as he does from Stockholm, I have never until now considered Yeovil to be in the slightest “wild”. Is there something I should know? Bruce, the main man with The Pineapple Thief, and Jonas, lead singer with Katatonia, took time out from their respective bands to get together and record The Wisdom Of Crowds album. Now, I have to admit that 50% of this band is an unknown quantity for me, as Katatonia are a band I have yet to investigate. The Pineapple Thief is the other extreme; I am probably too familiar with them, having seen them at least four times relatively recently, either as support act or headliners. After a quick YouTube investigation of Katatonia, it seems their stock in trade is doomy metal tinged songs on the subject of loneliness and depression. This is only slightly more sombre that Bruce’s usual lovelorn subject matter, so the latter writing an album’s worth of songs for the former seems a natural fit. After Nosound it was good that their songs upped the ante considerably. The predominantly electronic backing provided by the keyboard player’s Apple laptop gave the songs an electro-indie feel, sometimes recalling Massive Attack, and at other times Depeche Mode at their darkest. Ending with a rather fine song called The Frozen North on a night like this was an irony not lost on us three. At the end of their set a fan at the front presented Bruce with a pineapple, as you do! 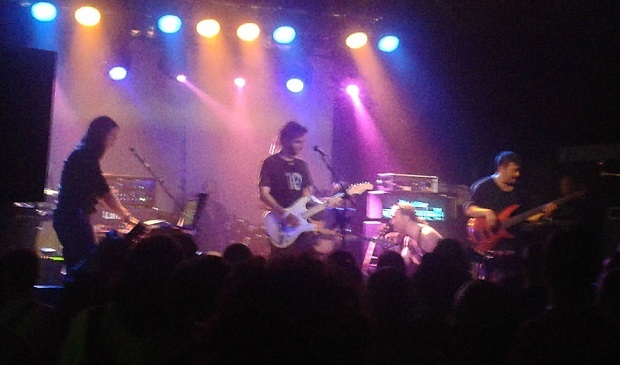 The venue was now packed out as the boys from Amplifier set up their equipment. It is good to see that Charlie Barnes has graduated from the fan we saw at 2000 Trees back in 2009 via the merch desk at subsequent shows, to become the full band member that he is now. Contributing a third (!) guitar to the line up, some keyboards and harmony vocals, Charlie gives the band an injection of yet more energy, not that they needed it. Once the band had assumed their stage positions, Sel wryly informed us that tonight in this hothouse atmosphere was “A great night to wear a black shirt”… “And a tie” someone shouted from the audience. The Amplifier uniform was all black, as always, and indeed every other act also wore that colour, which these days seems de rigueur for most bands. Why, one wonders, under the hot lights, especially on a night as steamy as this? Guitarist Steve Durose was towelling himself down before they had even started! Having filled the entire room with dry ice, Amplifier then treated us to a howling intro that led into Spaceman from the Sunriders EP, that came with the deluxe edition of the utterly fabulous Echo Street album from earlier this year. This kicked things off in a suitably intense fashion, only slightly marred by the mostly inaudible bass guitar during the song proper, but we knew this was going to be good. The bass glitch was sorted out by the second songThe Wheel, its undercurrent of repeated menace and hypnotic mantra-like coda suited the sub-tropical conditions to a tee. The only songs not from the last two albums were the last one in the main set, fan favourite Motorhead, and the encore Airborne, those two comprising the first two songs from their very first self-titled album, released back in 2005. But, before we get to that, mention must be made of the set highlight, an absolutely IMMENSE version of the classic rock spectacular that is Extra Vehicular. At this moment in time I cannot think of a better anthem than this monster, and Amplifier should be filling stadiums with this glorious racket if there was any justice at all. It was great to see Charlie leaping about with his sci-fi guitar, obviously having a ball, in fact the whole band were having a real good time, and are justly proud of their efforts, sons of guns that they are! You may have guessed by now that this was the song that had me moving in such a way as to inspire in Pete the awe and abstract fear mentioned way up there somewhere, bless ‘im! They then brought on Bruce Soord for Matmos, and the man from the Wild West was slingin’ yet another geetar, but perhaps wisely it was an acoustic, and he also lent his voice to a storming version of the Echo Street album opener. Unlike me, as Pete didn’t or couldn’t move/dance/have a fit, he did seize up, so the three of us left after Motorhead having been standing up for over four hours, no mean feat when you consider our combined age is 307, and despite the creeping fusion of the lower lumbar regions a great time was had by all. All credit must go to the sound technicians who did a sterling job, and to the few roadies who helped each band set up their equipment, a job that must have been hard work in the oppressive heat and humidity. As far as I know, Nosound were the only band that had to cut short their set, and the whole shebang was almost seamlessly organised. Congrats to the person or persons behind the logistics! Happy Birthday to Kscope, the UK’s premier label for forward thinking music, and let’s hope you last at least another five years so we can do this thang all over again! PS – If anyone who reads this went to the second night, I want to know all about it! *A UK-only reference – sorry! I’m sure they did Everyone In Sweden! If anyone knows the setlist, please let me know! Even less idea for this than Henry Fool. They definitely did The Frozen North. Again, any help to fill in this gap appreciated. Investigate and buy some fine sounds HERE.